Galway East Tourism - An Sciobal Restaurant in East Galway, West of Ireland.Galway East Tourism - An Sciobal Restaurant in East Galway, West of Ireland. 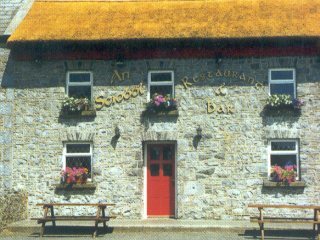 An Sciobal Restaurant and Bar is a quaint stone building with a thatched roof in the heart of Monivea village. In addition to offerring good quality food, An Sciobal has a bar which features live music. Groups and parties catered for.